Somebody better call NASA because your little space cowboy is ready to explore the next frontier! 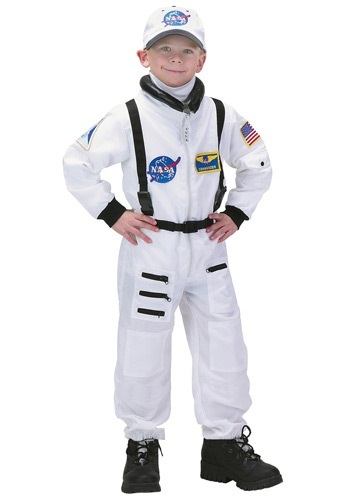 Grab him this Kids Astronaut Costume and it will look like a lunar expedition is just another day at the office. One thing’s for sure, he’ll be over the moon for this awesome costume. Your kiddo probably spends a lot of his time daydreaming of flying past stars and planets in an awesome rocket ship one day. He’s probably always up for an adventure that’s one small step for a man and one giant leap for mankind. Well once you grab him this amazing costume, he’ll be able to skip past all that tedious astronaut training and jump right into the fun stuff. Before you know it you’ll be face-timing your youngster while he’s hanging out in another star system. The technology to travel that far out in space may not be there quite yet. Although, as soon as NASA recruits your kiddo we’re sure his desire and commitment to space exploration will lead to a scientific breakthrough! Grab this Astronaut Costume and let his space-age adventure begin this Halloween. Trick-or-treating around the neighborhood will be the perfect time for him to practice his moon walking… not the dance move, but hear us out. A little astronaut doing Michael Jackson’s famous moonwalk would be the most adorable thing this side of the Milky Way! So get your camera ready this Halloween. You won’t want to miss a moment of your youngsters smiling face when he gets to run around town in this awesome costume. He’s bound to have an out of this world experience… space-bound!